As we move down from the neck, the next group of muscles we will look at we at will be those of the back. 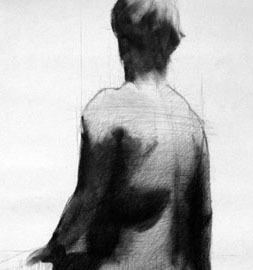 I find the back one of the more interesting yet difficult areas of the body to draw. There is so much happening in the back that it is easy to get lost in the forms of the muscles as they weave together to create the large mass that is the back. Learning what muscles make those forms and how they move the body makes the process easier when translating what we see into a drawing. Before we start looking the muscles we need to look at the skeletal structure that supports them. Today we will identify the major components that make up the skeleton of the torso as seen from the back. 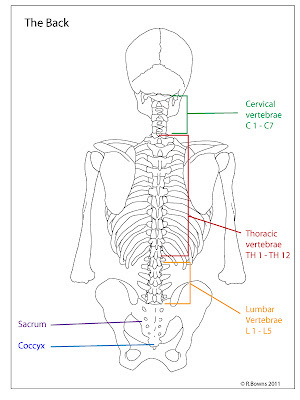 The spine or vertebral column is made up of 24 individual bones called vertebrae, along with two sections of fused vertebrae called the sacrum and coccyx. 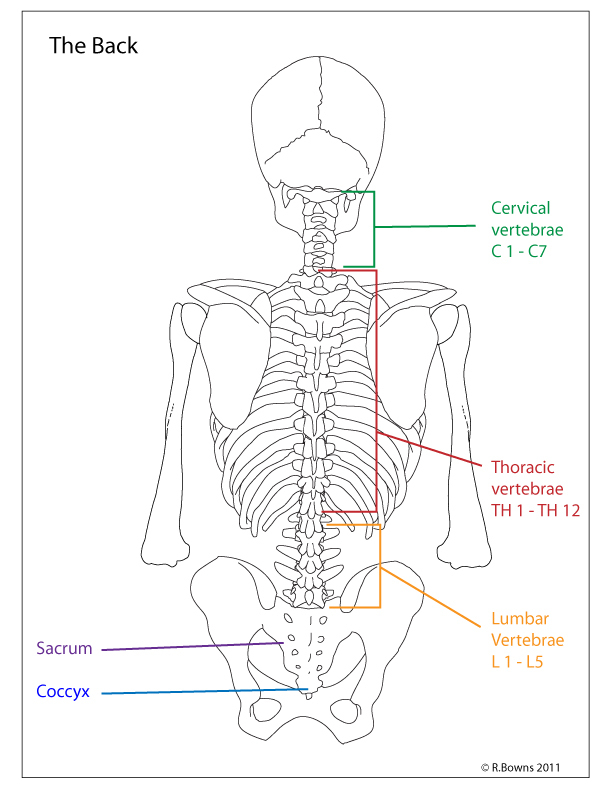 The vertebral column is what houses the spinal cord and supports the neck, head, and torso when standing up. The vertebrae of the spine are separated into three different regions that correspond to the neck, rib cage, and lower back. There are seven vertebrae in the neck. These are called the cervical vertebrae. When one twists his head to the side these vertebrae rotate and twist on top of each other. The seventh cervical vertebrae makes a good reference point to align forms. This bone sits just above the ribcage and protrudes out just slightly. 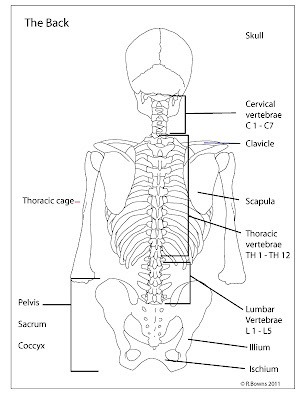 There are twelve vertebrae that correspond to the rib cage. These are the thoracic vertebrae, the ribs connect to the sides of these vertebrae and these also twist and bend to move the torso. 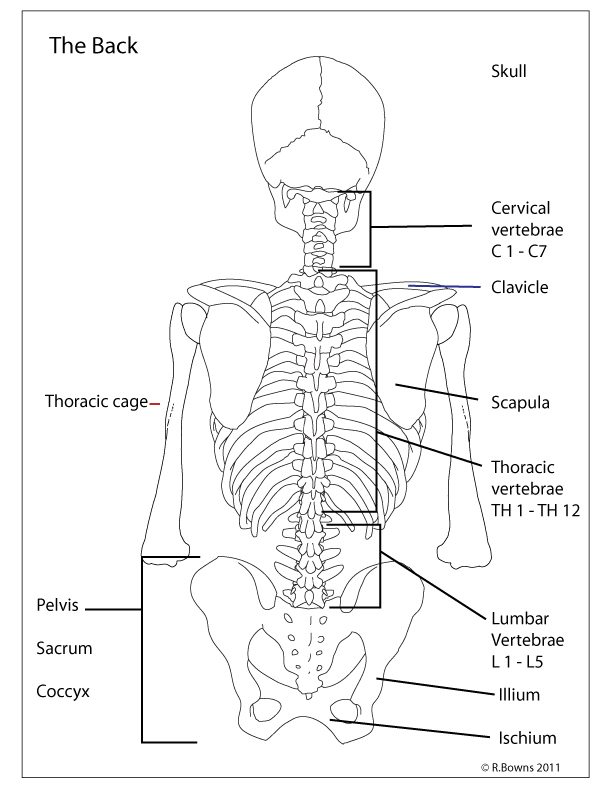 The last five individual vertebrae found at the base of the spine are the lumbar vertebrae. These vertebrae twist when a person twists her torso to the side. The sacrum is a group of fused vertebrae at the base of the vertebral column. 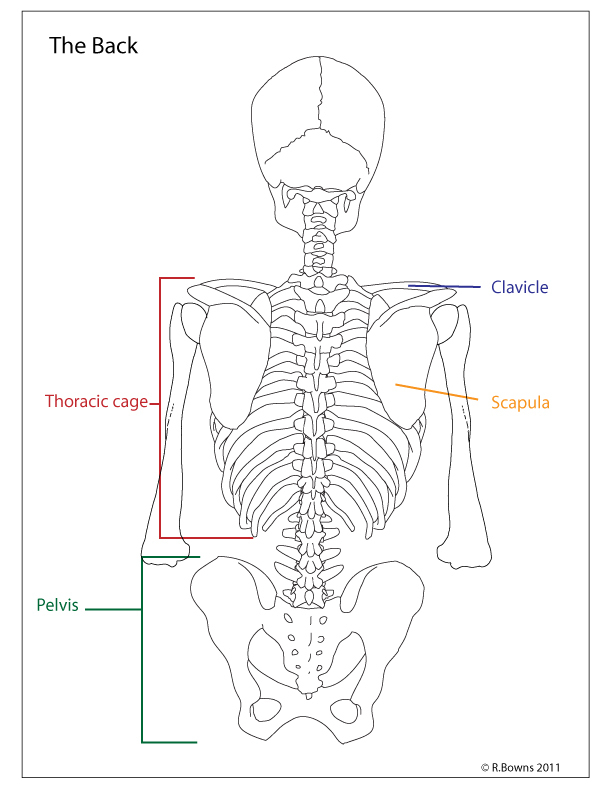 The sacrum is what connects the spine to the pelvis. The coccyx is the last bone of the spinal column. Also called the tail bone, this bone is the small bone attached to the bottom of the sacrum. The ribcage or thoracic cage the is the group of rib bones that form a rounded cage around the heart, lungs, and other organs. The muscles of the upper torso attach to this. 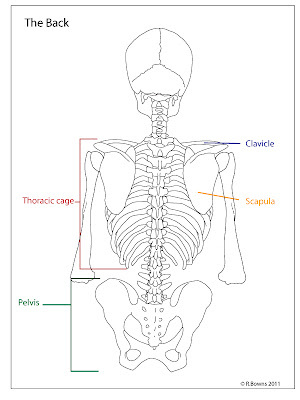 The ribcage protects the organs and flexes to allow for breathing and movement of the torso. What is commonly called the shoulder blade is a bone called the scapula. The scapula floats over the ribcage and meets the clavicle at the shoulder. The scapula assist in raising the arm up. Attached to the spine at the sacrum is the pelvis. The lower back muscles attach to the pelvis and assist in twisting from the hips. In the next anatomy post we will start looking at how the muscles of the back attach to the skeleton. There will be some parts of the skeleton that we can use as reference points in order to understand how the muscle line up. Is it possible to make one lesson: how to draw witch charocal or something similar? Coz I found difficult drawing with charocal without blending. I could do something like that. What are you interested in the lesson focus on? Nothing particular. Just technique (techniques?) how to draw realistically with charcoals. But without blending.